Cephalopods are the most morphologically complex group of mollusks. They occupy the same ecological niche as fish and they are arguably the most sophisticated group of invertebrates. The class includes active, jet-propelled predators with highly developed sensory structures. All cephalopods are marine. The body of cephalopods is elongated so that the mantle cavity is anterior and the visceral mass is at the posterior end of the animal (Fig. 9.8). Living cephalopods swim using jet propulsion. Water is drawn into and expelled from the mantle cavity through the hyponome, a modified part of the foot. As the mantle cavity opens anteriorly, the animal is propelled rapidly backwards. During slower locomotion the animal is able to direct its movement using the hyponome. Cephalopods are divided into three subclasses: Nautiloidea, Ammonoidea, and Coleoidea. Nautiloids have an external, chambered shell with simple sutures between its chambers. Ammonoids also have an external shell, always coiled, with variable and more complicated sutures. Coleoids have an internal and reduced shell. In some coleoids the shell is absent. The first cephalopods were straight-shelled nautiloids. They appeared in late Cambrian times and underwent a rapid diversification in the Ordovician when they gave rise to the coiled forms that existed throughout the Palaeozoic and Mesozoic. Although never as abundant or diverse as ammonoids, they survive through to the present day (Fig. 9.9). Ammonoids evolved from straight-shelled ancestors in the early Devonian. Their evolutionary history has been marked by a sequence of radiations followed by extinction. Peaking in diversity during the Jurassic, they declined through the remainder of the Mesozoic, becoming extinct at the end of the Cretaceous. Suture lines in ammonoids, the line tracing the junction of the chamber wall with the shell, increased in complexity through time. Palaeozoic ammonoids generally had simple, straight suture lines, whereas most Mesozoic ammonoids are characterized by complex sutures. The history of coleoids is less well known due to their reduced, internal shell. The first true coleoids are recorded from Carboniferous rocks. Early coleoids were similar to the first nautiloids but the shell was internal. Belemnites became abundant in the Jurassic and Cretaceous. Squid and cuttlefish are known from the Jurassic, diversifying in the Cenozoic after the end-Cretaceous extinction event. Fig. 9.8 General cephalopod morphology. Fig. 9.9 Diversity of cephalopod subclasses through geological time. Nautiloids have a chambered, external shell that may be straight or coiled, with simple sutures. The animal occupies the final shell chamber, the body chamber. The head, sensory functions, and hyponome are situated near the chamber opening and the visceral mass is at the rear. The animal is connected to the rest of the shell by the siphuncle, a tube extending from the body chamber to the protoconch (the first part of the shell to be formed) (Fig. 9.10). 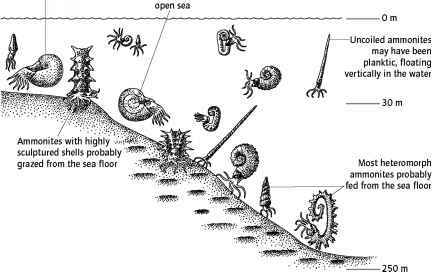 Most fossil nautiloids were active swimmers living close to the sea bed. Nautiloids with orthocone (straight) shells swam with their shell in a horizontal orientation. 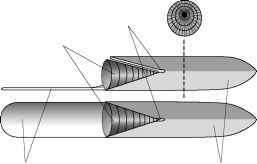 Shells were often modified in order to counterbalance the weight of the soft parts concentrated at the anterior end, thus maintaining stability. Nautiloids with coiled shells are more physically stable than straight-shelled forms. Nautilus is the only living cephalopod that retains an external, coiled shell. Living in cool waters in the southwest Pacific, at depths between 150 and 300 m, Nautilus relies on buoyancy control to adjust its position in the water column. Nautilus is an opportunistic feeder, grasping mainly crustaceans and small fish with its tentacles. Nautilus is a poor swimmer. Sea water is drawn into the mantle cavity and expelled through the hyponome. As water is ejected a force is exerted on the shell, causing it to lurch forwards. When the mantle cavity is emptied, the shell swings backwards generating a see-sawing motion. Consequently, Nautilus swims only for short distances and relies on buoyancy control to maintain its position in the water column during feeding. It rests during the day on the sea floor. Nautilus has an adjustable buoyancy mechanism that gives it neutral buoyancy at different depths of the water column. The shell chambers contain gas and sea water, the proportions of which can be changed (Fig. 9.11). Initially the chambers contain sea water. The siphuncle removes ions from solution in the sea water, drawing water from the chambers into the mantle cavity. Gas bubbles then diffuse into the space, making the animal more buoyant and able to float higher in the water column. By pumping ions into the chambers, Nautilus brings water back into the chambers, making the animal less buoyant so that it sinks to lower depths. Fig. 9.11 The buoyancy mechanism of Nautilus. 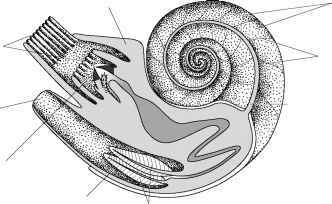 Most ammonoids had a chambered, planispirally coiled shell with complex sutures. 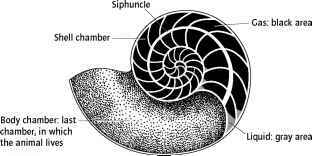 As with nautiloids, the chambers were connected by a tube called the siphuncle, although in ammonoids the siphuncle usually ran along the outer, ventral margin of the shell rather than through the center of the chambers. The buoyancy mechanism of ammonoids was therefore similar to that of nautiloids. Sutures are the lines marking the junction between the chamber wall and the ammonoid shell. The suture pattern is an important feature used in ammonoid classification. 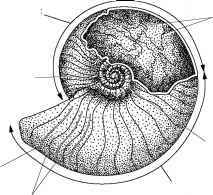 Only ammonoids with an ammonitic suture pattern should be termed ammonites. Sutures are described in terms of saddles and lobes. Saddles are curved sections of line that "point" towards the body chamber. Lobes are the converse - curves that are directed away from the body chamber. The complexity of the suture pattern increased through time. Early sutures were gently sinuous whilst the sutures of Cretaecous ammonoids had an intricate, fern-like form (Table 9.4). Ammonoids first appeared in the early Devonian. They evolved from straight-shelled nautiloids and the early forms had simple, straight sutures. Ammonoids rapidly diversified in the Devonian. By late Devonian times goniatitic sutures had developed as setae (chamber walls) became folded. Goniati-tids were the dominant Palaeozoic ammonoid form. In the Carboniferous more complicated, ceratitic suture patterns developed. Ammonoids persisted through the Palaeozoic but suffered a major crisis at the end of the Permian. Few ammonoids survived into the Triassic, but those that did radiated rapidly. Triassic ammonoids had ceratitic sutures, although complex ammonitic sutures developed towards the end of the period. More intricate sutures may have increased the strength of the shell, enabling ammonoids to live in deeper water. It has also been suggested that the greater surface area of the folded wall would have increased the speed with which ions were removed from solution and hence increased the speed with which the animal could change its density. The end-Triassic extinction eliminated most of the ceratitic ammonoids. Following the extinction, ammonoids rediver-sified, this time with the more complicated ammonitic suture. These are the ammonites, whose diversity peaked in the Jurassic. Towards the end of the Cretaceous, diversity began to diminish and none survived into the Cenozoic. 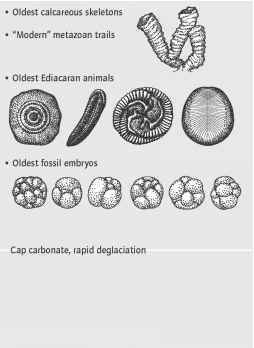 All groups of ammonoids are of use in biostratigraphy because of their wide distribution (enhanced by their ability to float after death) and their rapid evolution. Goniatitids are extremely useful in Carboniferous sediments, ceratitids in the Triassic, and ammonites through the rest of the Mesozoic. Table 9.4 Ammonoid suture patterns. Arrows point to the aperture. Fig. 9.12 Ammonite hard-part morphology. Table 9.5 Shell shape terminology. the external surface is often heavily sculptured with spines, tubercles, and ribs. Mature ammonite shells collected from the same horizon can often be divided, on the basis of size, into two distinct morphological groups. The smaller ammonites are referred to as microconchs and the larger type as macroconchs (Fig. 9.13). Microconchs may also have a modified aperture with lateral extensions, the lappets. The function of the lappets is unknown but it may be linked to sexual reproduction. Although microconchs and macroconchs may simply be closely related species, new characters appear in both groups simultaneously suggesting that they are males and females of the same species, though which is which is unknown. Some ammonite groups developed peculiar, "heteromorph" shell forms (Fig. 9.14), particularly in the late Cretaceous. Originally these forms were considered non-functional, evolutionary dead-ends. However, physical modeling has shown that they were stable and well adapted for floating within the water column. Furthermore, it has been shown that hetero-morphs gave rise to more conventional ammonite groups. Fig. 9.13 Sexual dimorphism in Perisphinctes (x 0.2). Fig. 9.14 Ammonoid heteromorphs in proposed life orientation: (a) Hyphantoceras, (b) Ostlingoceras, (c) Macroscaphites, and (d) Hamulina. Interpretations of the ammonite mode of life are based on the behavior of Nautilus. However, ammonite shell morphology is extremely diverse. The effect of shell shape on lifestyle has been investigated using numerical modeling to assess the stability of the shell within the water column and by observing the hydrodynamic properties of different shells in the laboratory. Any body immersed or floating in a liquid is acted on by a buoyant force equal to the weight of liquid displaced. The point through which this force acts is the center of buoyancy. The point through which the resultant force of gravity passes is the center of gravity. In a stable orientation the center of gravity lies directly below the center of buoyancy. The greater the distance between the centers, the greater the stability. By estimating the volume and weight of ammonites during life, the center of gravity and buoyancy of the animal can be calculated (Fig. 9.15). This work has established the probable orientation of ammonites with differing shell morphologies within the water column, helping to identify their likely mode of life (Fig. 9.16). Fig. 9.15 Life attitudes of ammonites: (a) Dactylioceras, (b) Ludwigia, (c) Crioceras, (d) another species of Crioceras, (e) Macroscaphites, and (f) Lytocrioceras. The arrows point from the center of buoyancy to the center of gravity. The solid dot is the center of buoyancy, and the cross is the center of gravity. The shaded area is the body chamber. Fig. 9.16 Possible life habits of ammonites. The subclass Coleoidea includes all living cephalopods except Nautilus. The shell in coleoids is internal and reduced or even absent. Modern representatives are diverse, highly modified, active predators with sophisticated sensory systems. Cuttlefish have an internal shell with a buoyancy function. Squids are streamlined swimmers with an internal cartilaginous rod (Fig. 9.17). Although they do not have a chambered shell they may increase their buoyancy through the retention of ammonia, which is a metabolic waste product less dense than sea water. Octopuses are benthic, shell-less coleoids with "webbed" arms that allow the animal to drift with the currents. Belemnites make up the majority of the fossil coleoids. Characterized by an internal skeleton with a robust, bullet-shaped, calcite counterweight, belemnites are abundant in Jurassic and Cretaceous rocks. Belemnites had an internal skeleton unlike that of any living coleoid. It can be divided into three parts: (i) the robust anterior counterweight - the rostrum or guard; (ii) the buoyancy mechanism - the phragmocone, a chambered conical section with a siphuncle; and (iii) the pro-ostracum - the support for an open body chamber. The rostrum was made from solid calcite composed of radially arranged, needle-like crystals (Fig. 9.18). Belemnite soft tissues are known from a few exceptionally preserved specimens. The tentacles had small hooks and some belemnites had ink sacs similar to those of modern squids. Fig. 9.17 Squid soft-part morphology. How are all cephalopod fossils similar? Did nautilus in mesozoic have a hood?